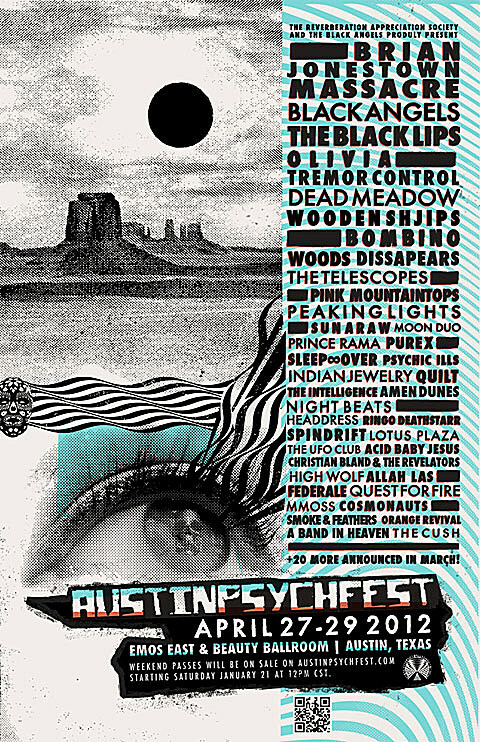 We knew the dates (April 27th – 29th), but now The Reverberation Appreciation Society and The Black Angels have released the initial lineup poster for the 5th annual Austin Psych Fest and it looks aswesome as usual. As mentioned on BrooklynVegan, this year’s fest will take place at Austin’s two newest big venues, Emo’s East and Beauty Ballroom right next door. Emo’s East is now the only Emo’s since their Red River location closed on 12/30, and the Beauty Ballroom is (hopefully) having their rescheduled Grand Opening on January 27th (with Theophilus London and Treasure Fingers) and continuing on January 28th. APF will feature around 60 bands over the three day, two venue event. About 40 are included in the poster above (and listed below), with another 20 or so to be announced in March. Announced bands include the Black Angels (who played Emo’s East on New Year’s Eve), the Black Lips, Brian Jonestown Massacre, Dead Meadow, Olivia Tremor Control, Wooden Shijps, and many more. Weekend passes go on sale this Saturday (January 21st) at 12pm CST at austinpsychfest.com. Check out photos from the 2011 edition of Psych Fest (held at Seaholm Power Plant) HERE. Chaos in Tejas, a different kind of Austin music fest that happens in June, also announced bands on their lineup today. SXSW, which is in March, continues to announce bands all the time and recently posted their initial schedule.